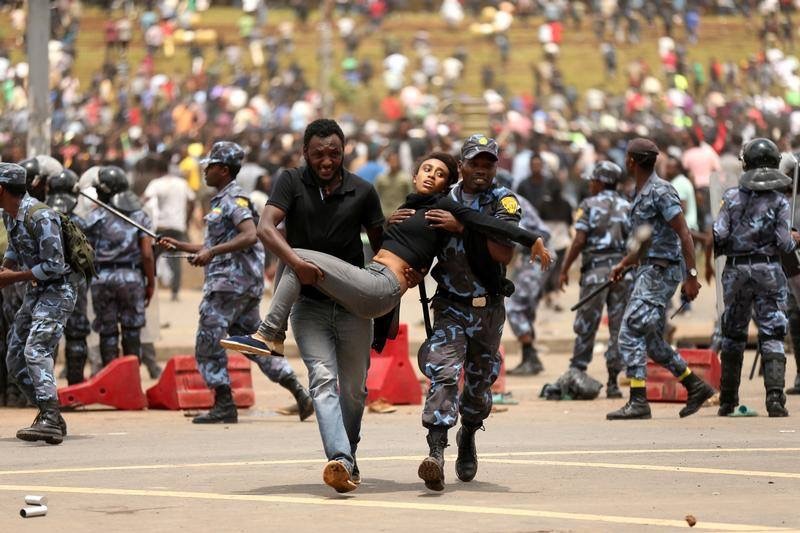 Addis Ababa, Ethiopia (CNN) — Police fired tear gas Sunday at demonstrators in Addis Ababa, Ethiopia’s capital, where tens of thousands had gathered to mourn a national hero. 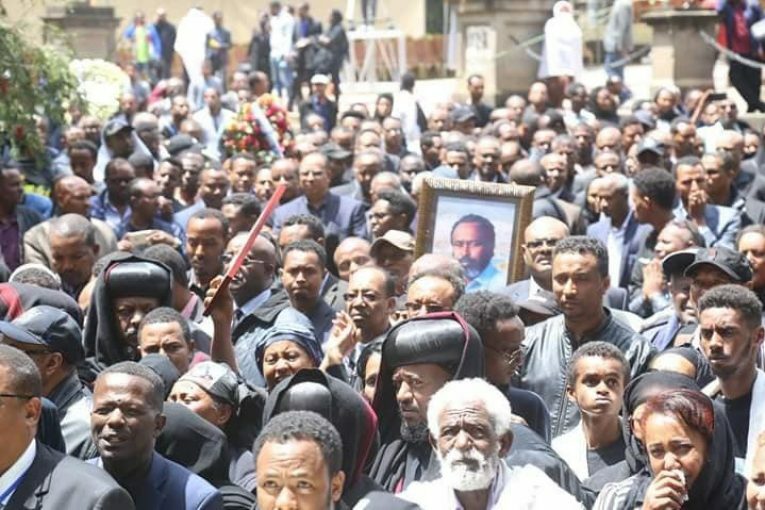 The unrest occurred at a state funeral for Simegnew Bekele, lead engineer on the $5 billion Grand Ethiopian Renaissance Dam project, who was found slumped at the wheel of his car Thursday with a gunshot wound to his head. Bekele’s body arrived in the city’s Meskel Square about 11 a.m. local time in a hearse adorned with garlands, followed by about 50 white cars. Witnesses told CNN that some members of the crowd became angry after they were prevented from following Bekele’s coffin to the church where he was to be laid to rest. The scene at Meskel Square in Addis Ababa during a state funeral for Semegnew Bekele. 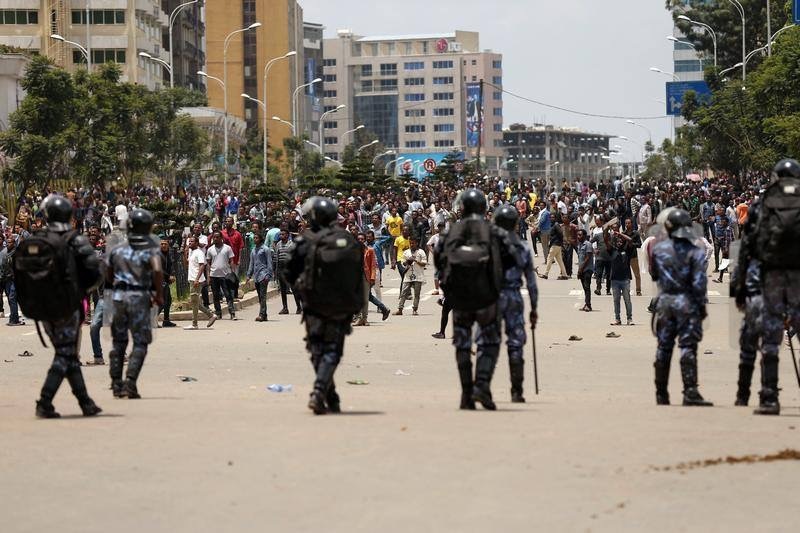 “For about 20 minutes, they were chanting that this government is not yet democratic,” said Bisrat Teshome, 35, an economist who was at the square. Several protesters then attempted to climb a pole and replace the current Ethiopian flag, which bears a star, with an older version without the emblem, in an act of political defiance. The star is a symbol of diversity and unity, but there has long been public annoyance that it was added to the flag without proper consultation, Teshome said. “They (the police) started throwing tear gas in between people. Then everyone ran away. It was the first time I had seen tear gas,” Teshome said. A handful of people were rushed to a hospital after being sprayed with tear gas, witnesses told CNN. When CNN contacted police to ask about the tear gas, an unidentified spokesman declined to comment and hung up the phone. Follow-up attempts to obtain a comment from Ethiopia police have so far been unsuccessful. Tens of thousands of Ethiopians gathered for Bekele’s funeral at Meskel Square — the same place where his body was found three days earlier in what is widely believed to be an assassination. Shouts could be heard across the capital as those gathered called for a proper investigation into Bekele’s death. Security for the state funeral was extremely tight, with roads around the square closed and armed soldiers lining the streets. Bekele was a hugely popular figure who had become synonymous with the nation’s ambitious flagship dam project, a source of national pride. A huge brass band led Bekele’s coffin through the city to Holy Trinity Church, where he was to be buried alongside Emperor Haile Selassie I, the late prime minister Meles Zenawi and British suffragette Sylvia Pankhurst. In a country splintered by tribal politics, Bekele’s funeral was a uniting factor that crossed ethnic lines. Simegnew Bekele’s funeral procession passes the Ministry of Foreign Affairs in Addis Ababa.